Friendly hostilities broke out in the Grosvenor saleroom on 24th and 25th September as enthusiastic clients, both in the room and bidding from distance, drove prices to exciting levels in what proved to be a remarkable BRITISH EMPIRE & FOREIGN COUNTRIES auction that achieved a grand total of £1,016,746. The section of the sale presenting the Mike Phelan collection of Persian Gulf created the greatest drama, containing as it did material that demonstrated its desirability by selling overall for almost four times its pre-sale estimate. 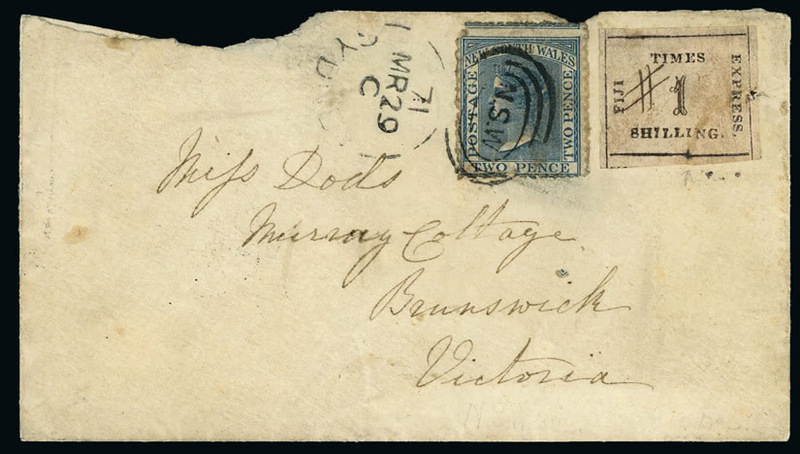 Among a host of surprise results, Muscat featured particularly strongly with a 1925 India registered envelope (lot 265), sent to London and redirected to London, reaching £1,658 (est £150-£200), after an attractive collection of covers, pieces and stamps (lot 264) had soared to a staggering £17,192 (est. £600-£700). This auction also featured a number of important presentations from areas rarely presented in such quality and depth. The Tuanjai collection of Fiji included two of the great rarities of Pacific Islands philately, the Fiji Times Express issues used on cover, there being just seven envelopes and three fronts recorded surviving to this day. 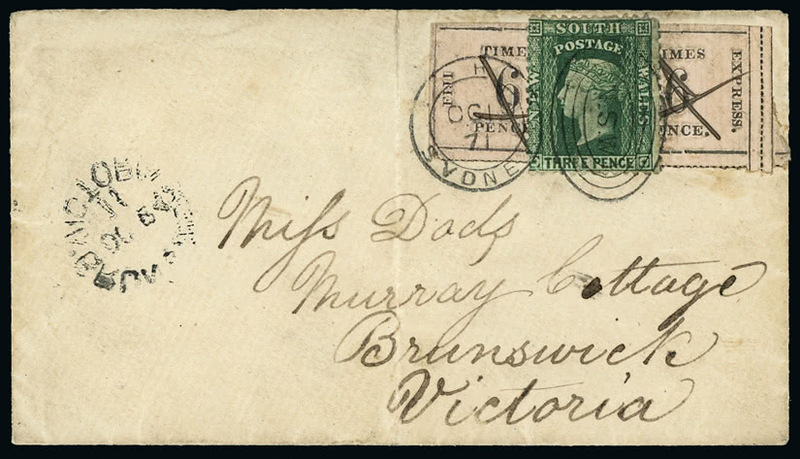 Both addressed to a Miss Dods in Brunswick, Australia, the first of these, bearing a 1s. value together with New South Wales 2d. blue (lot 878) achieved £8,596. Its attractive companion bearing a 6d. pair with New South Wales 3d. green, and also starring on the front cover of the sale catalogue (lot 879, left), rose to £26,180. A substantial section of the sale was devoted to a further offering from the remarkable Moore & Moore collection of Gibraltar, containing many impressive early letters and documents. 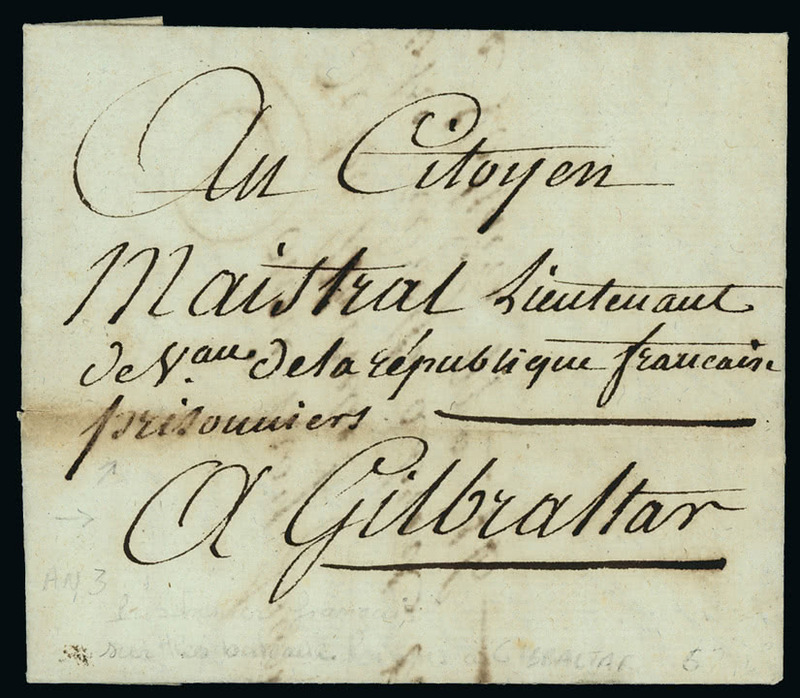 A handsome 1795 entire letter sent to his brother by a French prisoner of war on the Rock (lot 1096), believed to be the earliest such recorded, sold for £737. 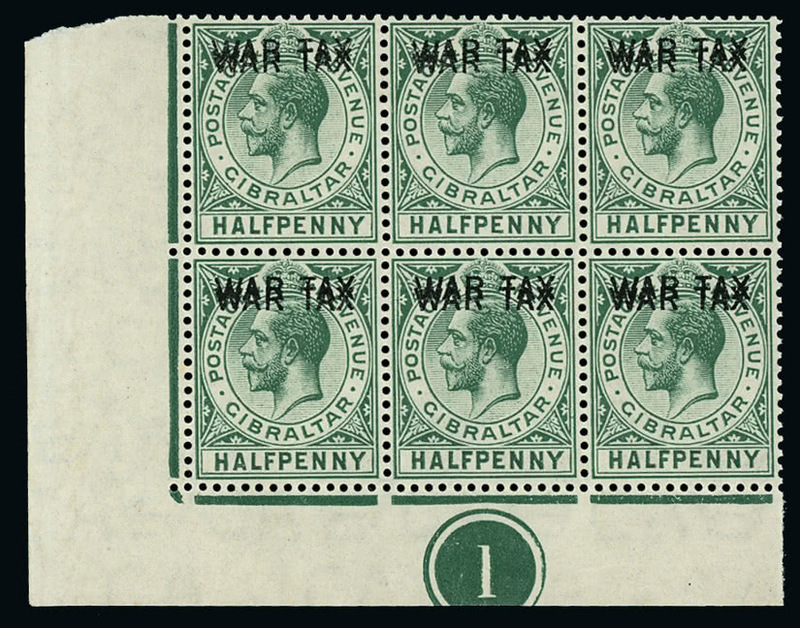 Among the issued stamps, the 1918 “WAR TAX” ½d. 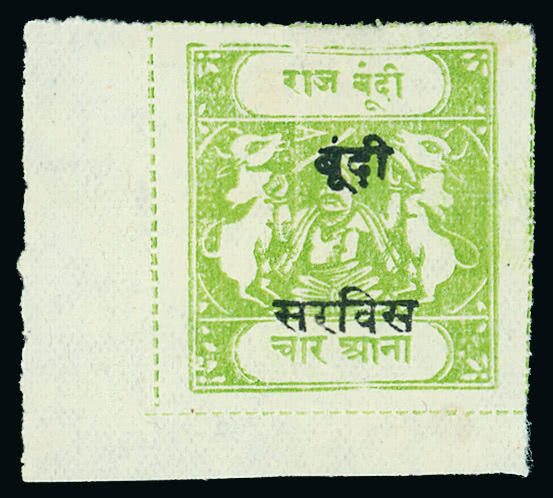 green showing overprint double and in an unmounted mint plate number block of six (lot 1281) fully merited its realisation of £7,122. The second part of the Dr Alan Huggins collection of British Levant postal stationery, although highly specialised, was again warmly received. 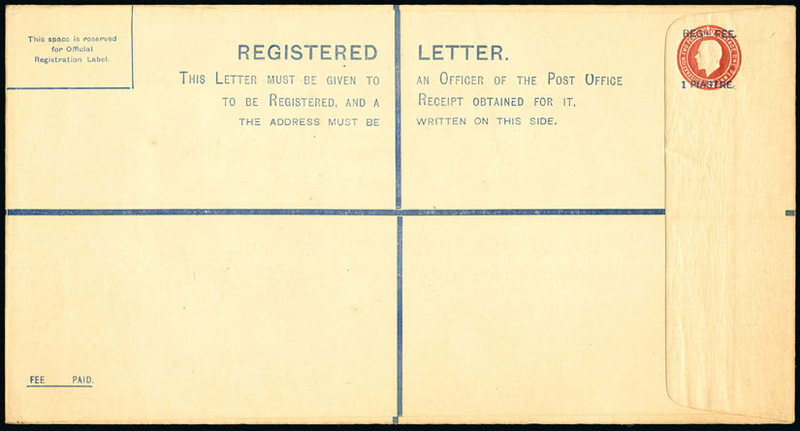 The surcharged registration envelopes included a fine unused example of the 1908 King Edward VII 1 Piastre on 3d. 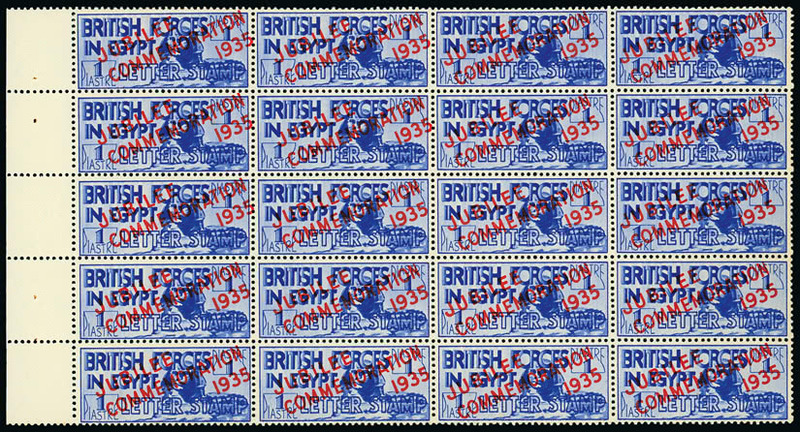 size F (lot 568) that sold for an excellent £619, perhaps unsurprisingly as just one other unused example is known, and that held in the British Postal Museum archive. 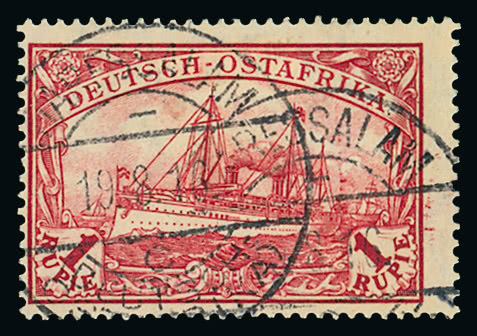 Elsewhere in the sale, exceptional East Africa from the Michael Ensor collection included a very fine used example of the rare German East Africa 1916 1r. carmine-red (lot 1074, left) that rose to £9,824, whilst an excellent example of the Indian classic ‘Red Scinde Dawk’ (lot 1422, above) from the Frank Deakin British Empire collection reached £14,982. A strong and popular section of Egypt featured the outstanding Stanley Horesh collection. In spite of a few noted tone spots, the British Forces 1935 Silver Jubilee 1p. in a booklet pane of twenty (lot 822) caught the eye by achieving a very creditable £7,140. The Hambledon collection of Bundi was greeted with the strong bidding now expected for all strong presentations of Indian Feudatory States. Grouped selections were well favoured whilst the top price paid for an individual item by a collector undaunted by the complexity of these issues, was £2,824 for the Official 4a. 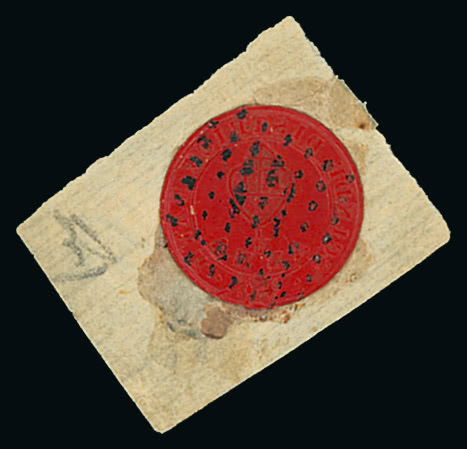 bright apple-green (lot 1509, left) with inscription type A and overprint type E.
Throughout the auction it was noted that demand for straightforward material is not currently at its strongest but this remains a tempting market for those considering the sale of anything fine and unusual, the competition for which at public auction can yield dramatic results.